The USPTO revealed a new Apple patent application (#306554) that describes a device with a flexible OLED display (the patent application specifically says it's an OLED) that can detect when force is applied - which means that you can press the screen as part of the user interface. The force-measurement layer, which will be placed on top of the OLED (or embedded inside the OLED panel itself, like the touch layer in Super AMOLED panels), will track whether the panel is being flexed using magnitude detectors such as strain gauges and optical sensors. Back in 2011, Nokia unveiled a beautiful new bendable device prototype called the Kinetic. The idea is that you can bend and twist the whole device to perform certain actions: for example bending it towards you is used to select an option or zoom-in on an image. This seems to be very similar to what Apple is proposing in this new patent. 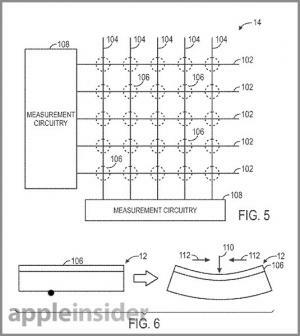 Tim Cook may claim that OLEDs aren't good enough, Apple has been showing interest in flexible OLED displays for a long time, and filed several related patents.